During World War II, as many as 30,000 Hamburg residents would cram into an enormous flak bunker to seek shelter from allied aerial attacks. 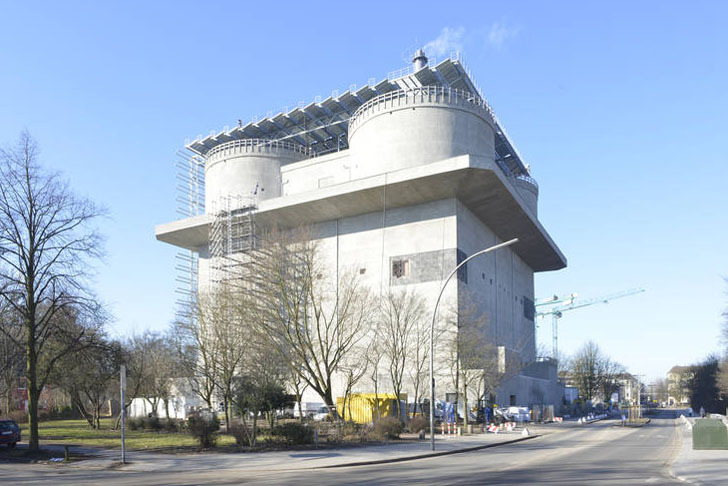 Now, the city is transforming the WWII relic into a renewable energy-generating bunker that will provide heating for 3,000 households and electricity for 1,000 homes. Inhabitat visited the concrete bunker back in 2011 to take a hard-hat tour of the structure. 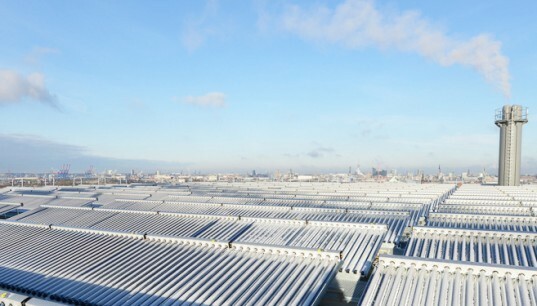 Since then, the transformation into a renewable energy plant has begun, and a large solar array has been attached to the bunker's roof and exterior. Construction on the bunker began at the height of the war in 1943, and in 1947 the British attempted to demolish the structure, but because the walls were so thick, they only succeeded in damaging it. Before any of the renewable energy components could be added, the structural integrity of the bunker had to be restored. Construction began last year on the 130-foot-tall structure, and the progress is beginning to show. A cafe has opened inside bunker, from which visitors can take in the views of the Wilhelmsburg district. As the weather warms this spring and summer, an open-air terrace will open on the roof with outdoor seating. A large solar thermal installation has been added to the roof of the bunker, and workers are currently finishing installing solar photovoltaic panels. The facility will also include a biomethane-fired combined heat and power plant and a wood-burning plant. Although significant progress has been made on the bunker, the entire Energy Bunker isn’t scheduled to be completed until 2015. Construction on the bunker began at the height of the war in 1943, and in 1947 the British attempted to demolish the structure, but because the walls were so thick, they only succeeded in damaging it. A large solar thermal installation has been added to the roof of the bunker, and workers are currently finishing installing solar photovoltaic panels. A cafe has opened inside bunker, from which visitors can take in the views of the Wilhelmsburg district. The facility will also include a biomethane-fired combined heat and power plant and a wood-burning plant. Although significant progress has been made on the bunker, the entire Energy Bunker isn't scheduled to be completed until 2015. As the weather warms this spring and summer, an open-air terrace will open on the roof with outdoor seating. Before any of the renewable energy components could be added, the structural integrity of the bunker had to be restored.